Create a device that harvests energy and would help further “off the grid”-reliant tech. 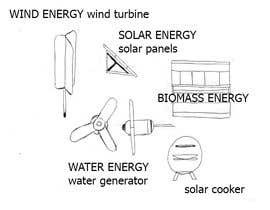 Any power source welcome (solar, thermal, ambient motion, etc.) the more creative you are the better! Contest submission will include a 3-5 page report outlining the description of the solution. Please include projected material cost and target applications. I am looking for a technology that exists in the real world today but the application is unique from current uses. 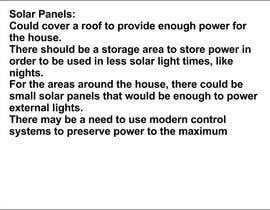 For example, is there a way to power a house, outside of the normal solar panels. Or solar based sidewalks or even a combination of solar / hydro powered devices. Some examples of problem / solutions: someone trying to power their house off-grid, how can energy harvesting power wearbles , etc. - power is all around us. The contest description is opened ended to inspire creative ideas. Hello, it would be helpful if you could be a little more specific. 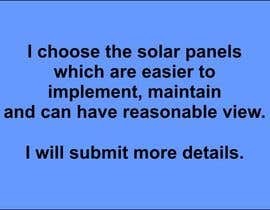 Do you want to power a off-grid house? is there any data around loads? or do you need some creative ideas like cold fusion, perpetual motion, etc. The more data I have, the better are my chances of delivering what you need. Thank you. Please bear in mind that the Contest Holder has only given a few days for a complex and in-depth project; that is not enough time to complete the work. Please bear in mind that the Contest Holder has not made a deposit, verified their phone number, or verified their payment method. This does not mean that the client is untrustworthy, but Freelancer.com advises us to keep all these factors in mind before submitting work to a contest. Contest Holder, if your work request is earnest, please consider verifiying the neccesary information on your account and extending the project deadline to a reasonable schedule. Hi Whetstone, I appreciate the concern for the community. I am new to the platform and this is my first contest. Rest assured I have verified my payment method and have deposited money into the platform based upon your feedback. Thank you for your feedback and I look forward to everyone's submissions! I am glad to hear this. Thanks for listening. P.S. I would strongly urge adding one to two weeks to the timeline with an #extended upgrade. Can you provide some more information about this project which may help us provide a little more focused solution!